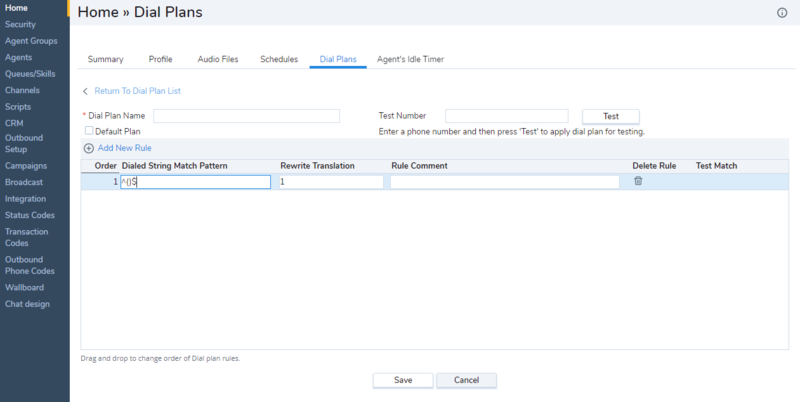 Creating a custom dial plan requires a sound knowledge of regular expressions. This sections gives a brief overview of creating a custom plan. You may seek professional services guidance for creating a custom plan from scratch. Click Home > Dial Plans tab. Click or Dial Plan link to add a new dial plan. Enter a name for the new dial plan. Check the option to mark this as the default dial plan. ()- A marked sub expression within which you define a string to match. For example, the pattern ^([2-9][0-9][0-9][0-9][0-9][0-9][0-9])$ defines a 7 digit sequence where the first digit is not 0 or 1. Define the treatment for the number that matches the specified calling number pattern. For example, The pattern ^([2-9][0-9][0-9][0-9][0-9][0-9][0-9])$ and treatment 1650$1 prepends a 7 digit input with '1650'. $1 represents pattern within the (). If you input 5551212, the treatment converts the number to 16505551212. Click (+) symbol to add a new rule. Click (x) to delete a rule. The pattern ^([2-9][0-9][0-9][0-9][0-9][0-9][0-9])$ and treatment 1650$1 converts a 7 digit input to 10 digits. For example, if you input 5551212, the number gets prefixed with the area code and converts to 16505551212. The pattern ^(55[0-9][0-9])$ and treatment 1650292$1 converts all 4 digit extension number starting with 55 to 165029255XX where X is mandatory single digit. Enter a sequence of digits and click Test to validate the calling number pattern and treatment you defined. The first matched rule shows the test result Applied.